World mythology includes old stories about an ancient humanoid race that existed before Homo sapiens arrived that once formed a great civilization. They looked somewhat like us except that they had scales, tails, strange cat-eyes, and were directly related to the reptile creatures of the planet. Some say the reptilians are still among us. There are stories that they live in a cavernous world that exists below the surface of the planet. Others think there are remnants of this ancient race of beings still living among us, except they have evolved to look like us. 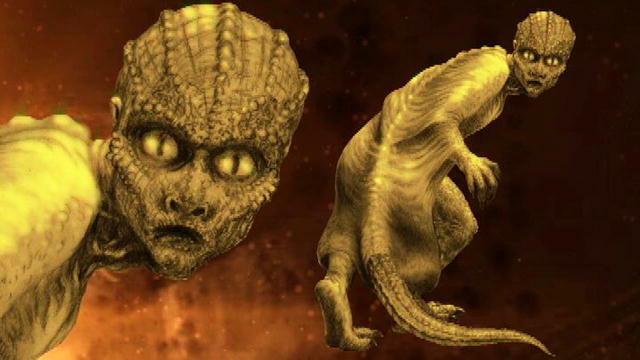 The only difference is that the reptilians are generally tall, they might have cat eyes that are extremely sensitive to light, and some may even have the remnants of a tail or scales on portions of their body. I personally knew of a man who may have been a reptilian. He was our high school band director, a man named Val. Val was a towering, extremely striking man who really had yellow eyes with pupils shaped like slits. He always had to wear sun glasses because he said he was sensitive to open sunlight. Val was a fine musician, a dynamic personality, and well-liked among the students. While I am told they exist, I never met another person with eyes like his, however. The late Stuart Wilde, who wrote of visions and dreams of a morphing reality, once said he peronally met a lizard woman. "She was American, from Boston I think, about 50 years old with high cheekbones, cruel eyes and very tight facial skin. Her lips were pencil thin but they curled and pouted as she talked. They reminded me of a lizard eating a moth. What I found so fascinating was that the woman was ice cold. Her face was pure white." Among the most radical conspiracy theorists is writer and lecturer David Icke, who has claimed that most of the world's leaders throughout history have been descendants of the ancient alien race of Reptilians that have crossed DNA with humans in ancient Sumeria. These people, Icke says, were known as the Annunaki. And this bloodline has been passed down to modern times among the elite, or the kings, queens and rulers of nations. Icke has claimed that former President George W. Bush was a servant of the lizards. American writer Vicki Santillano once penned that the notion that "Reptilian humanoids control all of us." For a while Santillano's story was among the top ten most popular conspiracy theories. Public personality Jesse Ventura in his Conspiracy Theory television series, recently tackled Icke's claims and came to the conclusion that there was no proof that such creatures existed among us. But we live on a very old planet that has had a long history of past civilizations and possible alien visitations. Could it be that we all are descendants of such a race of beings? Could we hold at least a cellular memory of such a world where lizards became the dominant species, evolving to become an advanced civilization at some distant time in the past? The archaeological and geological record suggests that Homo sapiens arrived too quickly to have been the product of natural evolution, so some believe humans may have been the result of genetic manipulation of Earth primates. It was through our cellular link with alien life forms that we developed nearly hairless bodies that walked upright and inherited the ability to reason, develop complex communication skills and build monuments. The question then, if this was our origin, were we the final result of perhaps centuries of experimentation? Would this explain the various bones of past humanoid, half-ape creatures found in the archaeological dust of the distant past? Does it explain the broad diversity of our kind even today? Suppose that one of the earlier genetic experiments produced a reptilian form of intelligence that succeeded for a time in the past. The record shows that there have been past mass extinctions and that life reappeared after each event. That we all evolved from the living Mother Earth means that we all retain a cellular memory of all things, past and present. We might then entertain a theory that all of the old myths about knights in Europe who hunted and killed dragons, to the Chinese symbols of dragons and the contemporary stories of humanoid lizards observed in remote areas of the world may all be drawn from that cellular memory of what once was.